There’s a wonderful story on NPR News about a father and son who are making the best of the tragic 2017 Tubbs fire in Napa and Sonoma Counties. Chris Cates and his son Andrew – of Segassia Vineyard – are rising from the rubble and trying to draw good from the bad. In a situation others might think is intolerable or hopeless, they are saying YES! The fire burned nearly 40% of their vines and Andrew lost his home, but this isn’t stopping them from working together to raise themselves up and at the same time help others. Using a patented process they developed a few years ago, the Cates utilize wine grapes that are not used in the production of making wine and turn those unused wine grapes into a tasty and healthy snack called RayZyns. After the Tubbs fire savaged their vineyard, the Cates used the smoke tainted wine grapes to produce Rescue RayZins. From every online purchase one dollar is split between the Napa Valley Community Disaster Relief Fund and the Food Recovery Network. The Cates have reached out to those affected by the fires in Mendocino County and are currently looking into working with government agencies to help out others affected by other natural disasters. If you’re interested in helping out and having a tasty snack, purchase Rescue RayZins here. For the full story, go to NPR News. 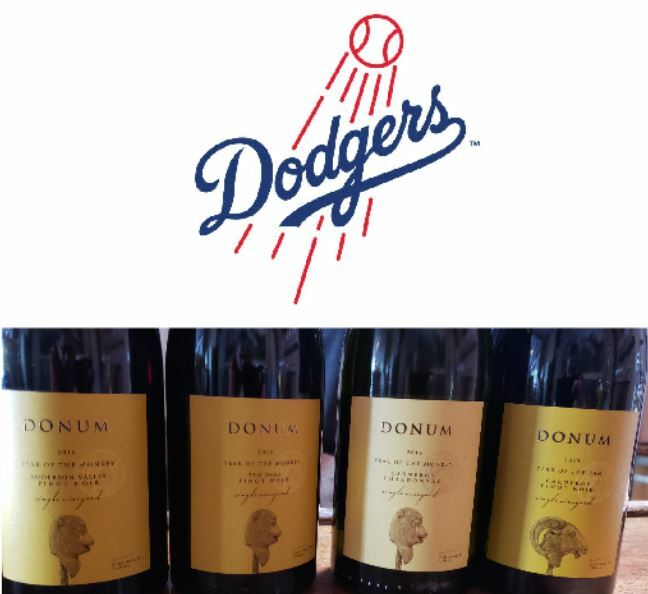 Just last week I was reminiscing about Donum Wines and lo and behold I get a visit from Teresa Harrison, national sales manager for The Donum Estate. I tasted through four wines – a Carneros chardonnay and pinot noir, a Russian River Valley pinot noir, and an Anderson Valley pinot noir – and all four were delightful. These are small production, highly acclaimed wines that I just adore. I’m hoping that The Bottle Shop will soon be stocking these wines so you too can enjoy these beauties. If you are ever up in the Sonoma area, make sure to make reservations for a private tasting. They have a superb sculpture garden on the grounds too. Check it out here at The Donum Estate. Department of say what!? Got a half a million bucks that you don’t need? Then you could have purchased the bottle of 1945 Romanee-Conti which is a French Burgundy wine sold for $558,000! SAY WHAT!? Sotheby’s had an auction last Saturday and sold the 1945 Domaine Romanee-Conti for much more than anticipated. The 1945 vintage is considered the most prized vintage for DRC and there were only 600 bottles produced in that year. I am assuming the bottle wasn’t stored in the trunk of someone’s car in Needles California or found at Rudy Kurniawan’s house. Just saying…. Department of How ’bout ‘dem Dodgers! Thrilling game last night as the Dodgers beat the Milwaukee Brewers 2-1 in 13 innings on a walk off single by Cody Bellinger with Yasmani Grandal on deck – YIKES! Thank God for Cody. Of course, the gatorade shower came a few minutes into the interview with Cody, however wouldn’t you think manager Dave Roberts would pop open a few bottles of his Red Stitch wine and pour that over Cody’s head? How about long-time Dodger favorite Dusty Baker? He’s got his own line of wines called Baker Family Wines. Let’s hope Clayton Kershaw doesn’t remember it’s October and pitches a hell of a game today. C’mon… wine over beer everyday any day! LET’S GO DOYERS!!!! Have you gotten your tickets for the upcoming Sip & Stroke? It’s our Wine & Art experience with German art, German food, and German wine! It’s happening Saturday, October 27th. For more information go to my Upcoming Events page. Commanderie de La Bargemone Rosé, Coteaux de’Aix en Provence 2017 $17.99 90 Points Vinous. My favorite French Rosé in the shop right now period. La Rioja Alta Vina Alberdi Reserva Rioja 2012 $22.99 92 Points James Suckling, 90 Points Robert Parker. Superb Spanish tempranillo – a classic! El Lugar Pinot Noir, Rincon Vineyard Arroyo Grande Valley 2016 $37.99 93 Points Wine Enthusiast One of my favorite wines from one of my favorite winemakers Coby Parker-Garcia. Bedrock Heritage Wine Sonoma Valley 2016 $49.99 95 Points Vinous, 95 Points Wine Spectator Now this is the zinfandel based blend that I should have poured last week instead of that other one that shall be forgotten quickly and not in 8 years. This is a superb blend. Powerful, refined, savory, and amazing. The Last Word: What comes between a person and eternal happiness? A wine cork. Previous Drunk Birds, Wine Advent Calendar, Loves Me Some LeBron, and Other Notes on a Wine Card. Next No f#@%$ Merlot!, Excuse Me Sir My Wine Is Flat, Bears beets Battlestar Galactica, And Other Notes on a Wine Card.